Hay should be relatively dust free, sweet smelling and fresh … damp or musty smelling hay is bad and should be thrown away or returned if you’ve just bought it. It can make your piggie and you ill.
Hay should form around 80% of diet and should be always available. Just placing in a couple of times a day is not sufficient. If you spend time watching guineas you will notice that they are grazers eating little and often rather than larger meals. Guineas eat hay throughout the day and night, often after a mouthful of veg or pellets. 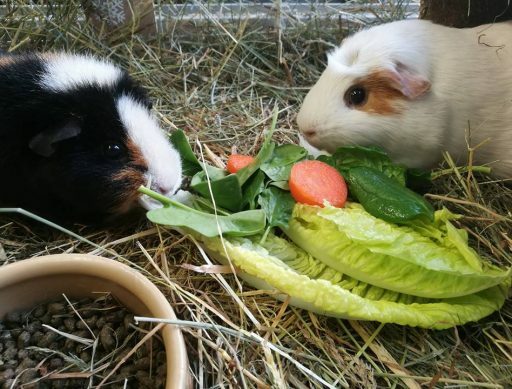 Hay is important for digestion and well-being: guineas get stressed when hay is absent and it can even lead to pairs falling out BUT most importantly their teeth never stop growing so hay is VITAL in order to grind their teeth down. Left without sufficient hay tooth growth can cause issues in just a few days. A guinea with severe dental problems will be unable to eat, will need expert intervention and hours of support feeding each day and may even die. 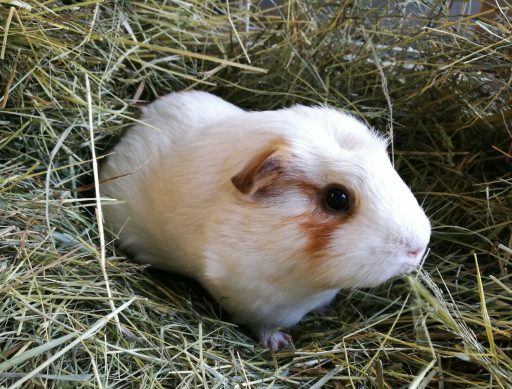 It’s SO simple and none negotiable – if you can’t have hay around, Guineas are not the right pet for you. Hay can be bought much cheaper by the bale so consider if you can source good hay locally and have a suitable place to store. Old duvet covers are ideal for transporting and storing baled hay. Every cage at Cavy Corner has a hanging hay twisty – they can be stuffed full of hay and guineas enjoy sitting underneath or pulling strands out to snack on. Fresh vegetables are important for vitamin C and variety of diet. Veg Time is the highlight of most guinea pigs’ day so they learn regular veg times and excitedly await! Never give frozen or frosted veg. Like humans, guinea pigs do not make vitamin C so must get it in their diet. Insufficient vitamin C can lead to scurvy affecting coat condition and mobility. So freshness and quality is important – if you wouldn’t eat it neither should your guinea. Guineas cannot physically vomit so it is really important they don’t eat any perished or “off” food. meal and just once a week. We also give herbs and fruits such as apple, melon strawberry and banana too. Because many guineas will selectively feed we do not feed or recommend muesli. Pellets will not be generally be overeaten IF there is plenty of hay. Most manufacturers recommend an amount per piggie. Although Pellets have vitamins added, the content can vary and will deteriorate once the bag is opened. It is important not to suddenly change a guineas dry food as they may refuse to eat. For that reason when guineas leave Cavy Corner they take a bag of pellets with them. We find bottles are more practical and cleaner than a bowl which may get trampled or pooped in or knocked over. 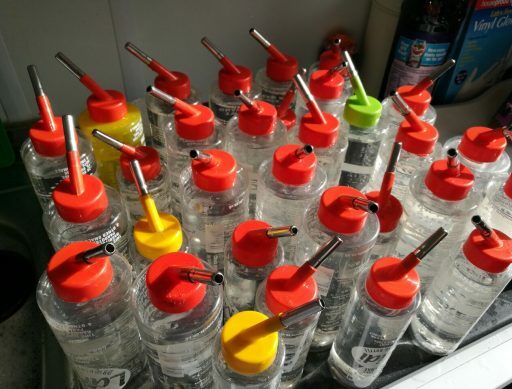 Guineas blow bits of food back into their bottles so water should be changed at least daily (more often in hot weather) We clean bottles daily with a good bottlebrush and use a cotton bud to clean inside up and down the spout. Water should be available 24/7. 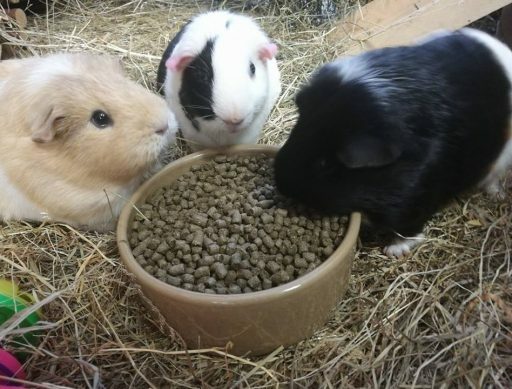 Supplements added to water bottles can cause guineas to stop drinking (and the supplements may also lose efficiency) A good diet with plenty of hay and fresh vegetables plus pellets and clean water generally provides what your guinea needs to be healthy.